At the 38th annual Gulf Coast Faith Formation Conference in January, Jill Cabes, MA, Vice President of Dominican Catholic Identity and Matthew Foss, MS, Science Department Chair at Dominican, were panelists in the parallel implementation workshop sessions on Science and the Catholic Faith: Overcoming the Myth of Conflict. The three-day conference was hosted and sponsored by the Archdiocese of New Orleans in collaboration with other dioceses in Louisiana, Mississippi, and Alabama. Each year, conference attendees include laity, clergy, and religious from the Gulf Coast and throughout the United States. This year’s conference theme was, Go Forth: That All May Be One, taken from the Gospel of St. John (17: 20-21). 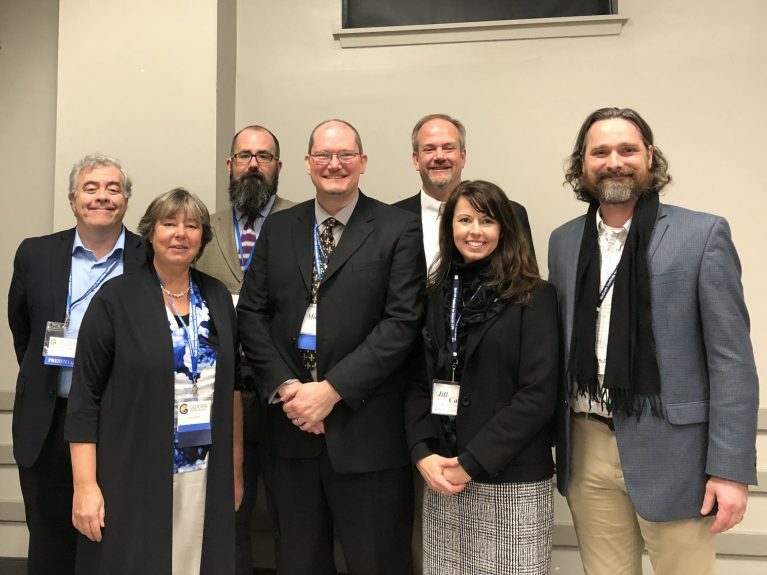 Matthew Foss and Jill Cabes (center) with Stephen Barr, Ph.D; Katherine Schilling, Ph.D., Holy Cross School; Tim Kettenring, D.Min., Holy Cross School; Chris Baglow, Ph.D.; and Cory Hayes, Ph.D. In her presentation, “Formation, Integration, and Catholic Education,” Mrs. Cabes discussed how St. Mary’s Dominican High School provided the faculty with the resources and formation needed to help their students see the complementary relationship between the Catholic faith and modern science. She discussed the importance of the school’s administrative support, initial and ongoing faculty formation, and shared some of the specific ways integration is happening inside and outside of the classroom at Dominican. Mr. Foss addressed “Integrating Physics, Philosophy, Math, and Theology.” For the past several years, he has been working with administration and colleagues on Dominican’s STREAM™ – Science, Technology, Religion, Engineering, Arts, and Math – initiative that Dominican announced in 2014. STREAM™ continues Dominican’s unique role in the formation of students who are believing thinkers and thinking believers. Mr. Foss gave an overview of the process that leadership and administration implemented to prepare faculty on how to integrate science, technology, religion, engineering, arts, and math into the school’s curriculum. He also shared his seminar-style learning experience as Science Department Chair and a member of the Math Department, and some of the lessons he has used in his physics and math classes. This year’s conference included a day-long seminar presented by the McGrath Institute for Church Life of the University of Notre Dame, “Teaching at the Interface Between Science and Religion.” McGrath Institute professors who addressed topics on science and religion included Stephen Barr, Ph.D., professor of physics and astronomy, University of Delaware; Chris Baglow, Ph.D., director, Science and Religion Initiative, McGrath Institute for Church Life, University of Notre Dame; and Cory Hayes, Ph.D., senior professor of philosophy and theology, St. Joseph Seminary College.